The movement north is in full swing, and by last week we only had a handful of owls still on their winter territories. Everyone else was on the move, or (maybe) already out of cell range. 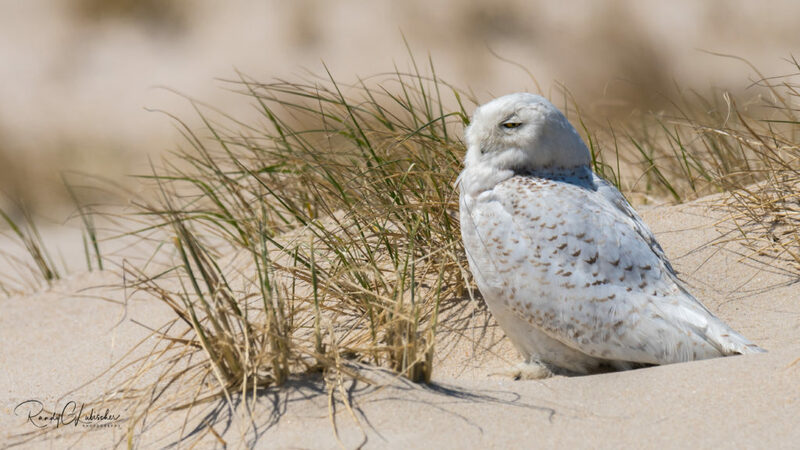 The movements have been especially strong in the East, where spring has finally started to make itself felt — but migration timing is only partially controlled by weather and temperature. Even more important, from a big-picture perspective, is the growing length of daylight, which triggers hormonal changes in a migratory bird’s body and turns the migratory itch into an overriding command. As of April 26, Brunswick had come in off the ocean and made landfall again on the northwestern tip of Prince Edward Island, just north of the village of Miminegash. 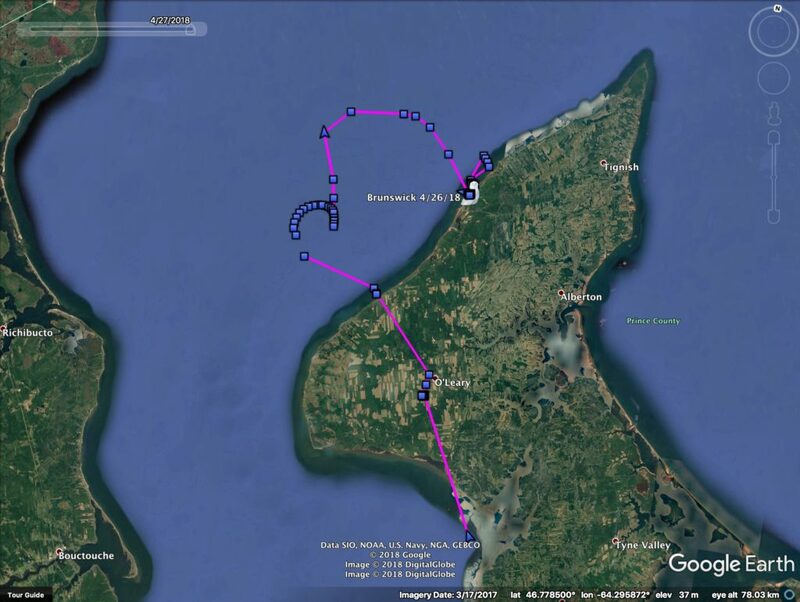 She’d been drifting (presumably on an ice floe) for a while, midway between PEI and New Brunswick, before coming to shore. 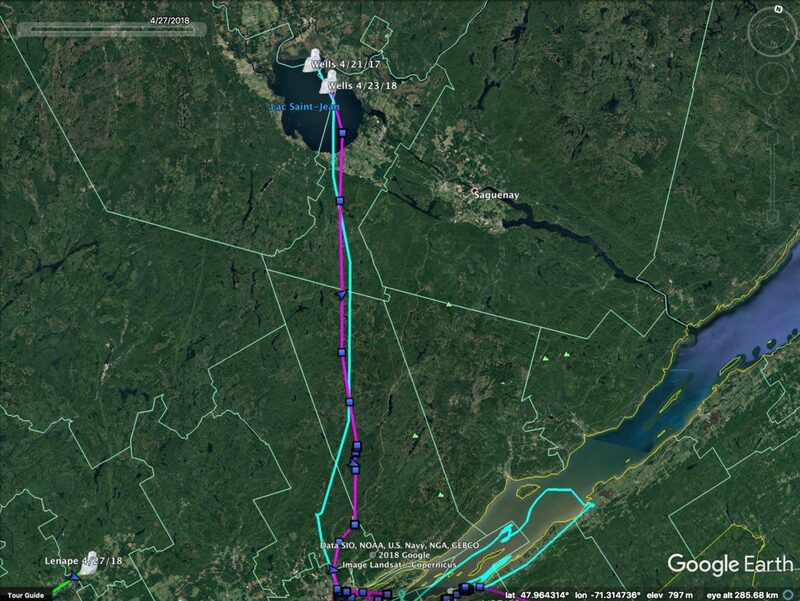 Logan remains near Montmagny, QC, on the southern shore of the St. Lawrence, where she’s been since April 10. But just across the river, Wells took off north on April 21, and on April 23 was on Lac Saint-Jean, about 205 km (128 miles) north of Quebec City, where she’d spent the winter. This is exactly the same route she took last year, and almost exactly the same timing — she arrived on Lac Saint-Jean last year on April 21. 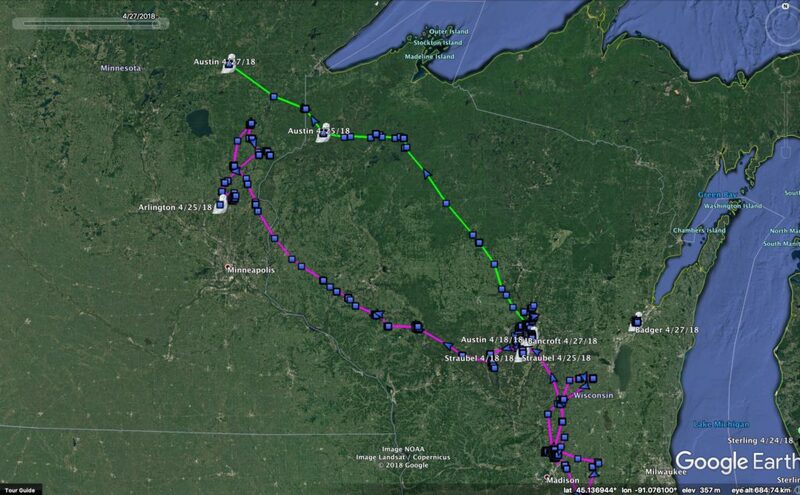 At last report (April 18) Chickatawbut was still on territory near Louiseville, QC, but she’s had some company. 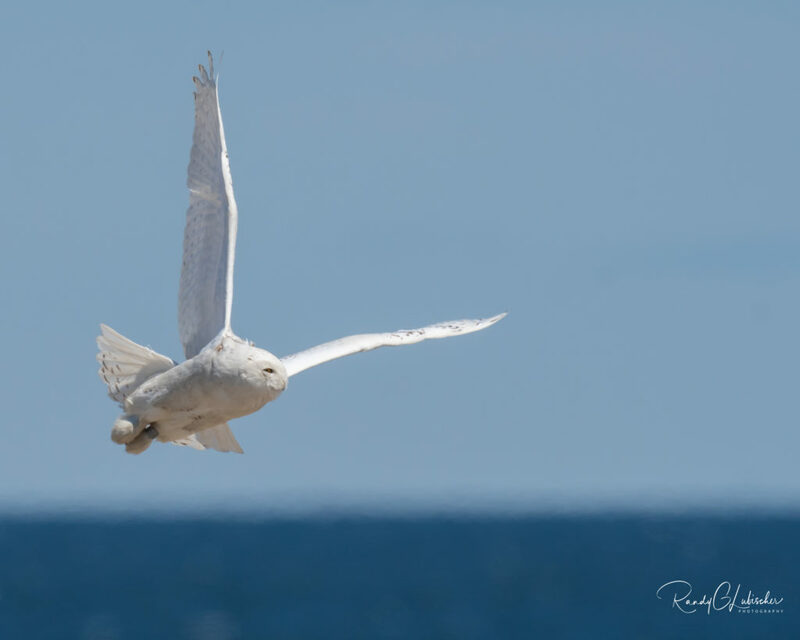 Lenape left the mid-Atlantic coast April 20, stopping briefly at Sandy Hook, NJ, where photographers got some great photos of him, then flying across Long Island and up through eastern New York, passing rapidly over the Adirondacks on the 24th. After giving Chickatawbut a fly-by, by the 27th Lenape was north of Trois-Rivieres, QC, on the edge of the cultivated lands of the St. Lawrence Valley. The other Jersey Boy of this winter, Island Beach, wasn’t too far behind. 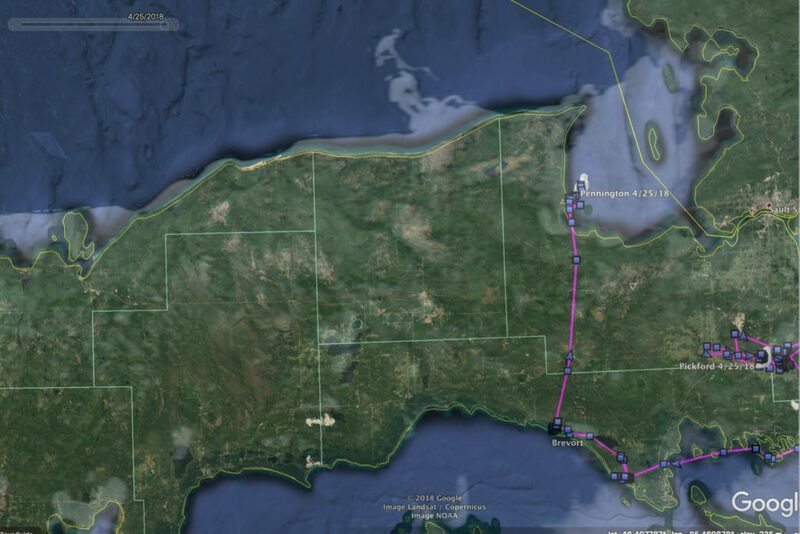 He’d left the New Jersey coast earlier than Lenape, making it to several large, uninhabited islands in the St. Lawrence just downstream from Montreal by April 24, where he’s remained. Speaking of Hardscrabble, this old male has been working his way north along Georgian Bay, and April 23 was on the ice on North Channel at the upper reaches of Lake Huron, not far from Thessalon, ON. And just west of him, both Pickford and Pennington have been on the move on Michigan’s Upper Peninsula. Pennington left the sand quarry along Lake Michigan, crossed the U.P. and on April 25 was on the fast-receding ice of Lake Superior in Whitefish Bay. Pickford didn’t go as far, but for the first time on April 27 she left her winter territory, and that evening was close to the Lake Superior shore. There remains no word from Gichigami, whom we now believe came to a bad end out on Lake Superior sometime around the end of February, the point of her last transmission. A day or two before her transmitter checked in, her accelerometer data (which monitors movement) flat-lined, and her on-board temperature sensor dropped to ambient levels, suggesting she had died — though why or how, we obviously can’t know, and likely never will. On the Lower Peninsula of Michigan, Sterling moved north a bit to Muskegon, where she was sitting on rooftops in residential neighborhoods on April 24. Over in Wisconsin, Badger is still hunkered down near Freedom, as is Bancroft up in the Buena Vista grasslands. But Straubel has been moving more widely around the area, and Austin lit out April 21 and by the 27th he’d migrated 243 miles (392 km) northwest into Aitkin Count, MN, on Big Sandy Lake. Arlington is also still in Minnesota, checking in April 25 from Isanti County farmland. We haven’t heard from Pettibone since April 10; he may have moved into an area with no coverage, or he may have made a fast getaway to the north, through the sparse cell network in southern Canada. Ashtabula was still in Burleigh County, ND, on April 23. Whew — a lot of ground and owls to cover, and the next weeks should be interesting, as birds move deeper into Canada and drop off and on the cell network. We could have some surprises, though, both during migration and this summer, since more and more bush communities are getting cell service, raising the odds of hearing from our birds off-season, as it were. We try to keep our map updates and blog summaries coming regularly every week, but the next 10 days or so may be a little erratic, as several of us will be out of the office or the country — including Drew Weber, who handles a lot of our web and social media stuff. Drew will be part of the Cornell Lab of Ornithology’s Global Big Day team in Colombia. No snowy owls for Drew, but lots of other amazing birds, we’re sure. Good luck, Sapsuckers! 4/29/18 At Fish Point in Michigan , (in the thumb area) I came across this male snowy which seems to have some sort of tracker on its back . Could it be a member of this project ? Someone suggested “Montgomery” ? If so , he looked well rested and quite healthy . I can send you pics if you like , Thank you . Today I witnessed a male Snowy at Fish Point Wildlife Refuge in Unionville Michigan with a transmitter on his back. It was 83* and he flew into a farmers field behind something large in the field, as I assume he was seeking shade. About 3:00 I drove by the field to see tractors plowing within feet of this Snowy. He would only fly a few feet until the tractors next pass when he would do the same. I can’t help but wonder if he overly stressed from the heat and or tractors presence. I have photos available upon your request.